Most U.S. police officers see significant challenges on the job in the wake of high-profile incidents involving law enforcement and black citizens. Among those challenges is a widespread feeling among officers that police are mistreated by the media, according to a recent Pew Research Center survey conducted by the National Police Research Platform. About eight-in-ten officers (81%) who work in departments of 100 or more sworn officers say the media generally treat the police unfairly, according to the survey. Just 18% of officers disagree. About four-in-ten officers (42%) strongly agree that the media are unfair to police. While the general sentiment among police that the media treat them unfairly is shared across gender, racial and ethnic lines, some officers feel more strongly about it than others. White officers (43%), for example, are more likely than their black colleagues (34%) to strongly agree that the media treat police unfairly. 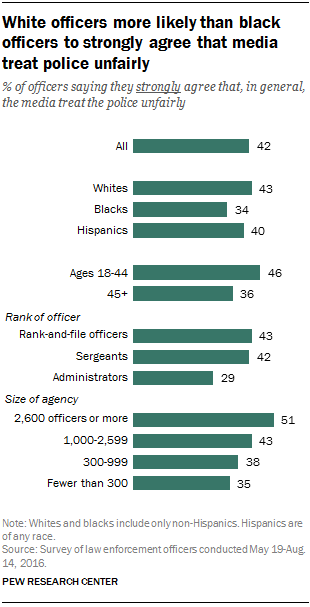 Among Hispanic officers, 40% strongly agree. Age is also correlated with views about the media. While 46% of officers ages 18 to 44 strongly agree that the media treat the police unfairly, fewer of those ages 45 and older (36%) express the same view. Police department administrators have a different view on the media than rank-and-file officers and sergeants. Only 29% of administrators strongly agree that the media treat police unfairly, compared with roughly four-in-ten rank-and-file officers and sergeants. Department size is also linked to views about the media. Officers from the largest departments are significantly more likely than those in small departments to see unfair treatment from the media: 51% of those in departments with 2,600 officers feel strongly about this, compared with only 35% among those in agencies with fewer than 300 officers. For police, attitudes about media bias are linked to other feelings about their jobs. Officers who feel strongly that the media treat police unfairly, for example, are more likely than their colleagues to say their work as a law enforcement officer nearly always or often makes them feel frustrated and even angry. Roughly two-thirds of officers (65%) who strongly agree that the media treat police unfairly say their work always or often makes them feel frustrated, and about one-in-three (31%) say it makes them feel angry. Feelings of frustration or anger are significantly less common among officers who don’t feel as strongly about media coverage of police. Further analysis would be needed to determine what comes first for police – cynicism about media coverage or feelings of frustration and anger – but these attitudes are clearly related. Officers who have a strongly negative view about the way they are treated by the media also are more likely than their colleagues to see a disconnect between themselves and the public. When asked how well the public understands the risks and challenges police face on the job, 56% of officers who strongly agree that the media treat police unfairly say “not well at all.” By comparison, 30% of officers who agree (though not strongly) that the media treat police unfairly say that the public doesn’t understand police work well at all, as do 25% of those who do not feel the media treat police unfairly.